Our Online Bible Study Community, also lovingly referred to as Kitchen Sink Missionaries, has already written the Book of Philippians. It was our “Joy Reset” month and Philippians was just the book to start with. Next, we started writing the Book of James. Our study in the Book of James is our “Faith in Action” study. 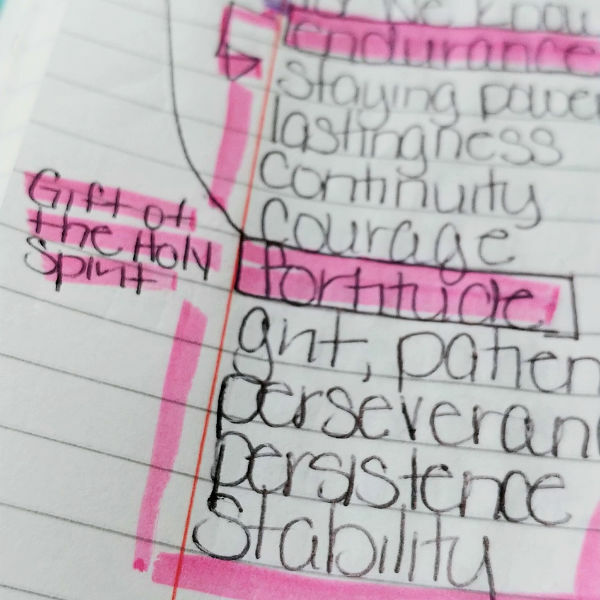 It’s also lovingly referred to as our “Let it Grow” study taking these words from James 1:4, “So let it grow, for when your endurance is fully developed, you will be perfect and complete, needing nothing.” I want to share with you how to Write the Word and practice the spiritual discipline of verse mapping. The first thing I did was write the Scriptures assigned to the day. 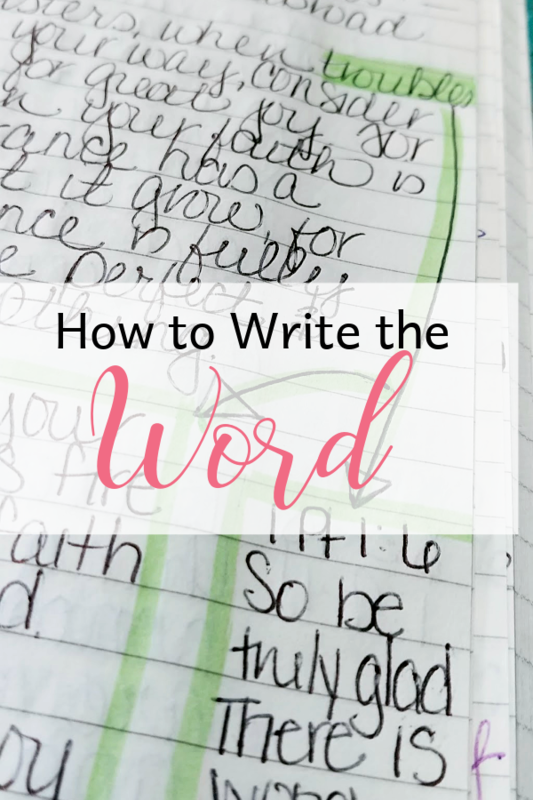 This daily Writing the Word worksheet comes in the Online Bible Study files. Each day there are a few verses to write. 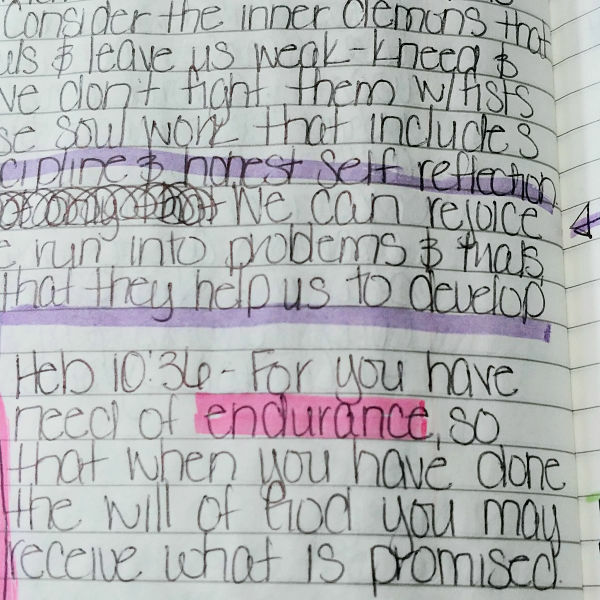 We each purchased a spiral notebook or composition notebook, something to keep all of our Scripture writing in one place. The next thing that caught my attention was the word “endurance.” That word made me think of “fortitude” which I knew was one of the Gifts of the Holy Spirit. I started wandering down rabbit trails playing with the word “fortitude.” The first thing I did was look it up in a Thesaurus. I wrote down a list of synonyms that seemed relevant to what I was studying. I then found commentaries, references, sermons, and articles about this word. As I studied and took notes in my composition notebook, I tried to group similar thoughts near the original passage. In an effort to keep things connected, I then used different colored highlighters to draw arrows connecting the passage to the notes. This verse mapping process can take as little or as long as you’d like. It’s simply making connections as God’s Spirit leads me. For example, as you read through this passage, your heart may be stilled or piqued at the word “joy” or at the idea of being perfect and complete. Your mind may stop and think, “Wait a minute. Isn’t there something in the Scriptures about being perfect like God is perfect?” That may be the verse mapping rabbit trail you are led down. This is just a way to dig deeper and make meaningful connections to the Word of life into your own life. Registration for our next month’s Online Bible Study will open sometime next week. Make sure you’re an email friend here so you won’t miss enrollment. It’s only open for a few days the last week of the month, you don’t want to miss it!